Background Strong proof-of-principle for utilisation of diffuse reflectance spectroscopy, a non-invasive tool for early detection of malignant changes, has emerged recently. The potential of this technique in distinguishing normal tissue from hyperplastic and dysplastic tissues was explored. Methods Diffuse reflectance (DR) spectra in the 400–700 nm region were obtained from the buccal mucosa of 96 patients and 34 healthy volunteers. The DR spectral data were compared against the gold standard biopsy and histopathology results. A principal-component analysis was performed for dimensional reduction in the normalised spectral data with linear discriminant analysis as the classifying technique. The receiver operator characteristic curve technique was employed for evaluating the performance of the diagnostic test. Results DR spectral features for different lesions, such as normal/healthy, hyperplastic, dysplastic and squamous cell carcinoma (SCC), varied significantly according to the intensity of oxygenated haemoglobin absorption. While the classification based on discriminant scores provided an overall sensitivity of 98.5% and specificity of 96.0% for distinguishing SCC from dysplasia, they were 100.0% and 95.0%, respectively, for distinguishing dysplasia from hyperplasia. Similarly, the analysis yielded a sensitivity of 95.0% and specificity of 100.0% for distinguishing hyperplasia from healthy tissue. The areas under the receiver operator characteristic curves were 0.98 (95% CI 0.95 to 1.00) and 0.95 (95% CI 0.90 to 1.00) for distinguishing dysplasia from SCC and hyperplasia from dysplasia, respectively. Conclusion DR spectral data efficiently discriminate healthy tissue from oral malignant lesions. Diagnostic accuracies obtained in this study highlight the potential use of this method for routine clinical practice. Diffuse reflectance spectroscopy in early detection of oral cancer. Discriminatory capacity of diffuse reflectance spectral data to differentiate normal tissue from pre-malignant and malignant tissues. Diffuse reflectance spectral data efficiently discriminate healthy tissue from oral premalignant and malignant lesions. Linear discriminant analysis using leave-one-out method of cross validation on the principal components of spectral data provides improved diagnostic accuracies. The study results highlight the potential use of this method for oral cancer screening in routine clinical practice. Non-invasive technique for oral cancer screening with relatively good sensitivity and specificity. Real-time data aid in quick decision making and no requirement for massive additional resources and specialised staff for screening. This study is limited to buccal lesions. An independent study covering all sites on a larger population is useful for utilisation of this technique for mass screening applications. Oral cancer is a significant global health problem with more than 10 million new cases and 6 million deaths each year worldwide.1 Developing countries contribute to more than half of all cancer cases and are currently witnessing an escalating cancer epidemic.2 In India, oral cancer is the third most common cancer and constitutes 16.5% of all cancers with relatively high incidence rates of 21.5 and 12.8 per 100 000 men and women, respectively, in the age group 35–64 years.3 It remains a lethal disease for over 50% of cases diagnosed annually, largely reflected by the fact that most cases are in advanced stages at the time of detection.4 5 The ability to observe disease onset and progression through non-invasive and cost-effective screening methods at the population level may help to implement the prevention and treatment strategies at an early stage. High-quality studies to assess the efficacy and effectiveness of reliable non-invasive techniques for early detection of oral cancer are necessary to recommend the inclusion of these methods in a nationwide population-based screening programme. Principal-component analysis (PCA) is the most versatile multivariate analysis method, the goal of which is to decompose a data set with correlated measurements into a new set of uncorrelated or orthogonal variables. It is a simple, non-parametric method of extracting relevant information from a large data set for reducing its dimensionality and identifying meaningful underlying variables. The present study explores the possibility of using a diagnostic algorithm developed based on PCA to distinguish normal/healthy from hyperplastic and dysplastic tissue of DR spectra recorded by means of a compact point monitoring system with white-light illumination. Normalised spectral data in the 400–700 nm region was dimensionally reduced by PCA and classified using linear discriminant analysis (LDA). The receiver operator characteristic (ROC) curve technique was employed for evaluating the performance of the diagnostic test, and the results are presented. The study population consisted of a total of 34 healthy volunteers maintaining good oral hygiene (without any inflammations/visible lesions in the oral cavity) selected by a dental pathologist and 96 patients with clinically suspicious potentially malignant (erythroplakia and leucoplakia) and cancerous lesions, registered in the outpatient clinic of Government Dental College, Trivandrum. Patients with lesions only in the left and right buccal mucosa, retromolar area and intraoral commissure of buccal mucosa were included in the study. The healthy volunteers were students within the age group 20–35 years. Other inclusion criteria were: (a) patients older than 20 years of age; (b) no previous history of treatment for cancer with radiation or chemotherapy; (c) no history of use of any medication orally for the past 7 days; (d) no life-threatening medical condition, which requires an emergency response; and (e) willingness to provide written informed consent. Before enrolment, the study subjects were examined for suspicious lesions in their oral cavity, including white/red patches, non-healing ulcers and proliferative growth. Oral lesions, clinically suspected of erosive lichen planus, were not included in the patient group. The study was conducted from February to June 2010, and the protocol was approved by both the scientific and ethics committee of Government Dental College, Trivandrum, Kerala, India (ethics committee approval number: IEC/C/28-A/2010/DCT). Written informed consent was obtained from all participants, after explaining the study procedures in detail and before initiating any study-related measurements. A study information sheet was provided to all participants, and an independent third person explained the study procedures to the subjects, if any were illiterate, before taking the written consent. Prior to measurements, the study subjects were asked to rinse their mouth with 0.9% saline solution, in order to reduce the effect of recently consumed food. A detailed structured questionnaire was administered to collect demographic, behavioural and clinical data. The study subjects were asked to stop their habits of smoking and chewing tobacco or alcohol use at least 12 h before spectral data measurements. 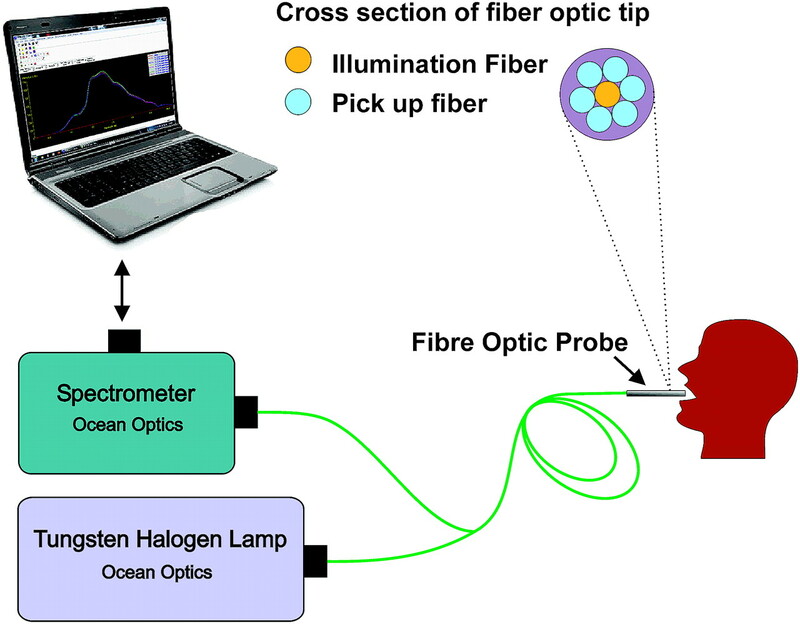 DRS measurements were obtained with a portable and compact point-monitoring system (figure 1) consisting of a tungsten halogen lamp (Model LSI-LL, Ocean Optics, Dunedin, Florida) for tissue illumination and a fibre-optic spectrometer (Ocean Optics; Model: USB 2000FL VIS-NIR) connected to the USB port of a laptop10 for recording DR from tissues. The central fibre of a 3 m long bifurcated fibre-optic probe with a flat tip (Ocean Optics; Model: ZR400-5-VIS/NIR) delivers the incident light to the lesion and six surrounding fibres (400 μm diameter each) at the probe tip collect the diffusely reflected light emission. A disposable black sleeve made of polyvinyl chloride was inserted at the probe tip, which was terminated in a stainless steel ferrule of 15 cm length and 6 mm diameter for extra hygiene and maximisation of the recorded signal by providing optimal overlap between the excitation and collection areas. The spectra were recorded in the 400–700 nm wavelength region using the OOI Base32 software (Ocean Optics, Inc. Version 2.0.0.3) that was configured to record the spectra, averaged for 40 scans with a boxcar width of 10 nm and an integration time 100 ms. Fifteen sets of spectral measurements were taken from the right and left buccal mucosa of healthy volunteers, and all lesion sites of patients identified by the clinician for the study. Schematic of the diffuse reflectance point monitoring set-up used in the clinical trial. An incisional biopsy was taken from the measurement sites of all patients who showed malignant features in the DR spectra, and the samples were fixed in 10% formalin and sent to the laboratory for pathological analysis. The tissue samples were then dehydrated with derivatives of ascending grades of alcohol (methyl alcohol, ethyl alcohol, etc) or acetone, embedded in paraffin block, microsectioned using microtome and mounted on a thin glass plate. This was then stained using H&E stains. Two oral pathologists, who were blinded to the spectral measurement details, prepared the slides and provided the histo-pathological results independently. A third opinion was sought if there was any disagreement between the two independent reports. The spectroscopic study results were then correlated with histopathological findings. Recorded spectral data were normalised to the peak intensity of individual spectra and averaged with respect to different lesion groups. Data were separated into standard data (training) and blind data (validation) sets, with all spectroscopic measurements from a single patient randomly assigned to either the training set or the validation set. The training set was used to define a set of spectral features: (a) to reduce the data to a diagnostically relevant subset of the spectral features; and (b) to develop a diagnostic classification algorithm based on the identified subset of spectral features. DR spectra were preprocessed to minimise interpatient variation by normalising each spectrum to its peak spectral intensity.16 A PCA was performed on the normalised spectral data of all subjects for dimensional reduction without losing much information provided by the original normalised spectral data set. Those principal components (normalised mutually orthogonal eigenvectors) for which the eigen values of the sample variance–covariance matrix are greater than or equal to one were retained for further analysis. PCA with varimax rotation provided eight PCs, which together accounts for 99.5% of the total information (variance) of the original spectra (PC1 provides 41% of variance, PC2 gives 30%, PC3 gives 18%, PC4 gives 6%, PC5 gives 3%, PC6 gives 0.9%, PC7 gives 0.8%, and PC8 gives 0.3%). Further, the extracted PCs were tested for significance, using analysis of variance (ANOVA), across different lesion groups. Six PCs, PC1, PC2, PC4, PC5, PC6 and PC8, showed significant differences (p<0.05) between different lesion groups. An LDA was performed to generate a discriminant function based on the linear combination of the predictor variables that provide the best discrimination between different groups. The significant PCs (p<0.05) were used as the input variables of LDA. Furthermore, a diagnostic algorithm was developed using the discriminant functions with a leave-one-out method of cross-validation. Diagnostic accuracies were determined from the discriminant function scatter plot. ROC curves were also constructed using the discriminant function scores to assess the potential of DRS data to differentiate precancerous/cancerous lesions from benign/normal. The area under the ROC curves (AUC) and its 95% CI, including the true value of AUC, was computed. The statistical significance of AUC was tested using non-parametric assumptions. All statistical analysis were conducted using SPSS statistical software for Windows (V.11.0.1). Healthy subjects included 34 volunteers, whereas the diseased sample group consisted of patients with differing lesion grades: 26 hyperplastic, 20 dysplastic and 50 squamous-cell carcinoma (SCC). While the training data set included 22 normal/healthy samples, 16 hyperplastic (benign), 12 dysplastic (mild, moderate and severely dysplastic) and 30 SCC cases (well, moderately and poorly differentiated), the validation data set comprised 12 normal, 10 hyperplastic, 8 dysplastic (three mild, four moderate and one severely dysplastic) and 20 SCC (nine well, seven moderately and four poorly differentiated) cases. The mean age of the healthy volunteers (mean age=28 years, SD=7 years) was significantly lower than that of the patient group (mean age=50 years, SD=15 years). While all the patients included in the study were current users of tobacco (pan-chewing), most of the male patients (65 out of 70) reported current smoking and regular alcohol consumption. In comparison, the healthy volunteers did not use tobacco or alcohol. The mean DR spectra of buccal mucosa recorded from normal/healthy, dysplastic, hyperplastic and SCC tissues given in figure 2A,B show significant dips around 545 and 575 nm owing to oxygenated haemoglobin absorption. 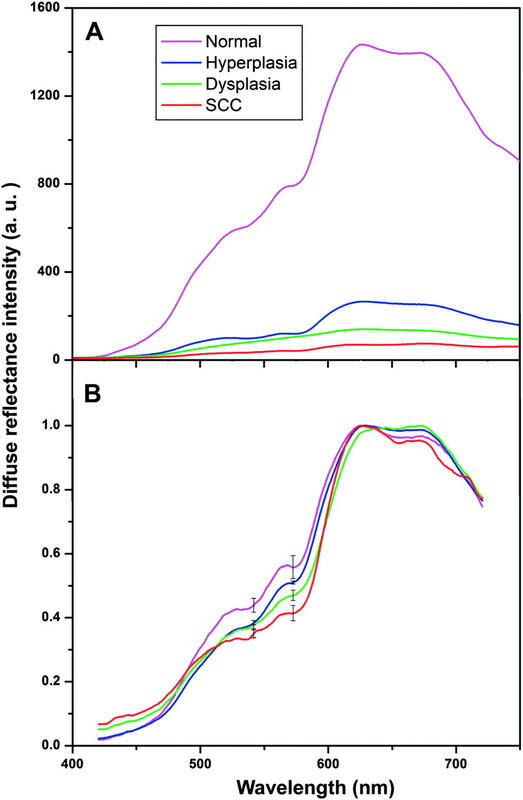 A marked variation in the in vivo diffuse reflectance spectral intensities between SCC, dysplasia, hyperplasia and healthy mucosa is observed (figure 2A). The mean DR spectrum after normalisation with peak intensity for the different groups of tissues is shown in figure 2B. Table 1 gives the averaged normalised DR spectral intensity at oxygenated haemoglobin dips (545 and 575 nm) and intensity ratio (R545/R575) for different tissue types. It can be seen that the intensity of the oxygenated haemoglobin absorption dips are more prominent in healthy/normal volunteers (0.44±0.05 at 545 nm and 0.56±0.06 at 575 nm) than in patients (0.36±0.07 at 545 nm and 0.41±0.11 at 575 nm). Significantly lower spectral intensities were noticed in hyperplastic (0.41±0.01 at 545 nm and 0.51±0.01 at 575 nm), dysplastic (0.39±0.07 at 545 nm and 0.47±0.07 at 575 nm) and SCC (0.36±0.07 at 545 nm and 0.41±0.11 at 575 nm) lesions in comparison with DR spectra from normal/healthy volunteers (table 1). Furthermore, the spectral intensity ratio (R545/R575) increases significantly with tissue abnormality, that is, from healthy tissue to hyperplastic, dysplastic and SCC lesions (p<0.005). Averaged diffuse reflectance (DR) spectral features from the oral cavity of 34 healthy volunteers and 96 patients (26, hyperplasia; 20, dysplasia; 50, squamous cell carcinoma (SCC)). (A) DR spectrum of different lesion groups and (B) DR spectrum after normalisation to the peak intensity. The error bars relate to the standard deviation at 545 and 575 nm. A discriminant function scatter plot of different lesion pairs for standard (training) and validation (blind) data sets is shown in figure 3. In the training dataset, the normal, hyperplastic and dysplastic lesions were classified correctly with cut-off values of −0.64 and 1.04 respectively for the discriminant score, which are the weighted averages of the discriminant scores of normal–hyperplastic and hyperplastic–dysplastic lesions. However, in a group of 12 dysplastic and 30 SCC cases, one case with SCC was misclassified as dysplastic, while another case with dysplasia was misclassified as SCC, with the discriminant score cut-off value at 1.58. In the validation dataset, out of 10 cases of hyperplasia one was misclassified as normal in the normal–hyperplasia pair. Similarly, in the hyperplasia–dysplasia pair, one out of the 10 cases of hyperplasia was misclassified as dysplasia. However, all cases of dysplasia and SCC were classified correctly with 100% accuracy (figure 3). Discriminant function scatter plot of different lesion pairs. (A) normal–hyperplasia, (B) hyperplasia–dysplasia and (C) dysplasia–squamous cell carcinoma (SCC). The solid symbols represent functions of a standard data set, and open symbols correspond to a blind (validation) data set. The continuous line represents the cut-off value in each pair. 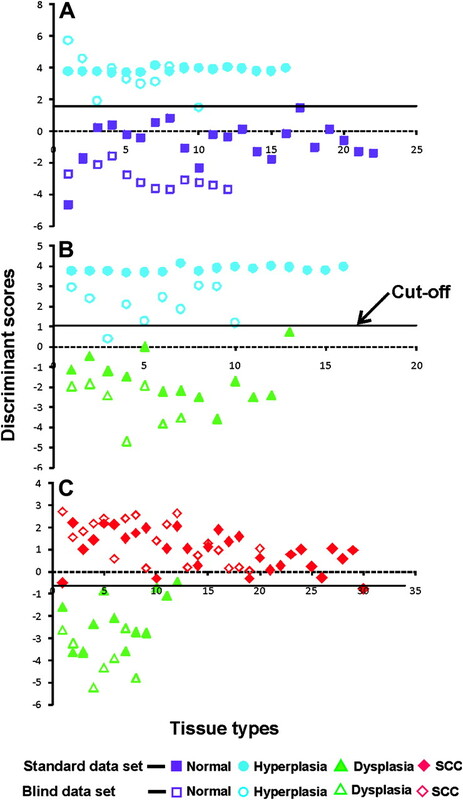 The overall sensitivity and specificity for a discriminant score cut-off value of −0.64 to differentiate between healthy and hyperplastic tissue were 95% and 100%, respectively. Similarly, with a cut-off value of 1.04, a sensitivity of 100% and specificity of 95% were achieved to distinguish hyperplastic from dysplastic tissue. Finally, to differentiate dysplastic from SCC tissues, a sensitivity of 98.5% and specificity of 95% were obtained with a cut-off value of 1.58 for the discriminant score (table 2). The ROC analysis with a discriminant score yielded AUC of 0.983 (95% CI 0.95 to 1.00) and 0.954 ((95% CI 0.90 to 1.00) respectively, for distinguishing dysplasia from SCC and hyperplasia from dysplasia, while distinguishing hyperplasia from healthy tissues the ROC analysis yielded an AUC of 0.987 (95% CI 0.96 to 1.00) (figure 4). In comparison, using the R545/R575 ratios given in table 1, an ROC–AUC of 0.81 was obtained for distinguishing dysplasia from SCC (95% CI 0.70 to 0.91), while for distinguishing hyperplasia from dysplasia, the ROC–AUC value was 0.89 (95% CI 0.82 to 0.96), and for distinguishing hyperplasia from normal, the value was 0.84 (95% CI 0.75 to 0.93) (figure not shown). 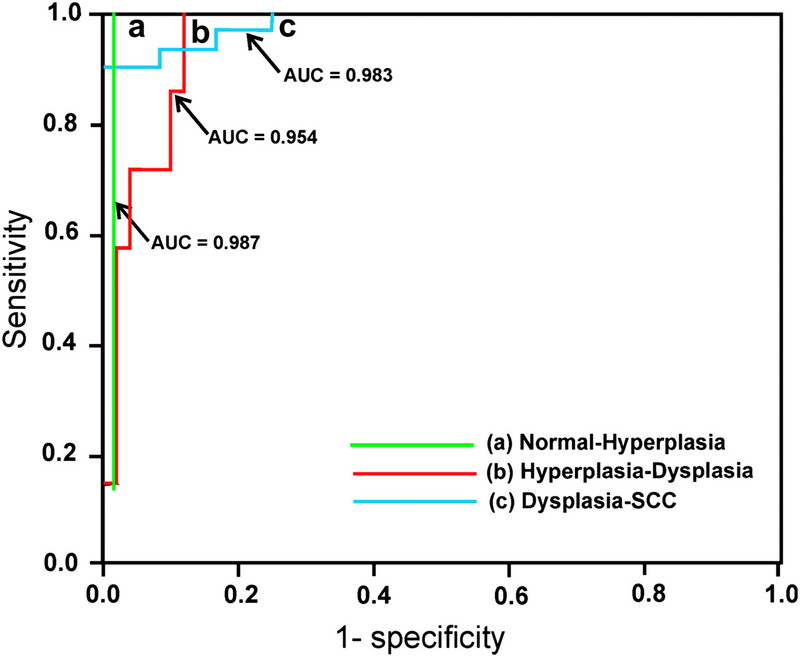 Receiver operator characteristic curves showing the diagnostic performance of discriminant scores of function for discerning (a) hyperplasia–dysplasia and (b) dysplasia–squamous cell carcinoma (SCC). AUC, area under the receiver operator characteristic curve. This study, carried out in the outpatient department of a tertiary care hospital, provides strong evidence of the utility of a low-cost, non-invasive screening technique for early detection of a wide range of epithelial lesions in the oral cavity. The DR spectral data at 545 and 575 nm, generated from a portable and compact fibre-optic point monitoring system, efficiently distinguished malignant lesions in the oral cavity of patients into different grades such as hyperplasia, dysplasia and SCC. The sensitivity and specificity yielded from this diagnostic evaluation study evidently support the inclusion of this technique for routine screening of oral cancer in clinical settings. Significant dips in the normalised mean DR spectra around 545 and 575 nm were observed from normal/healthy volunteers, hyperplastic, dysplastic and SCC lesions. Furthermore, the spectral intensities at these dips were more prominent in healthy/normal volunteers in comparison with the spectral data from patients with premalignant changes and SCC. DR spectral features mainly depend on the absorption and scattering properties of tissues and on oxygenation levels of haemoglobin.12 17 18 Increased absorption at thickened epithelium, local architectural changes in the cellular and subcellular levels including changes in the nuclear cytoplasmic ratio of the epithelial cells, stromal properties and neo-vascularisation contribute to the decrease in reflectance intensity with abnormality.19 20 When tissues become malignant, the haem synthesis is disturbed or broken down owing to the reduced activity of the enzyme ferrochelatase,21 thereby leading to lower production of haemoglobin and correspondingly lower oxygenated haemoglobin absorption around 545 and 575 nm. The LDA of the significant PCs based on the spectral intensity data and further stratification of tissue types based on the discriminant score yielded a very high sensitivity and relatively good specificity, to distinguish normal tissue from abnormal tissues (suggestive of premalignant changes and SCC) in the oral cavity. The ROC curve analysis further confirmed the utility of this screening technique for early detection of malignant changes in the oral cavity. The AUC for the discriminant score analysis reached nearly 100% and conclusively proved the utility of the screening technique for early detection of oral cancer. Furthermore, the diagnostic algorithm developed based on the PCA was comparatively better than the utility of simple spectral intensity ratio (R545/R575) to distinguish between different tissues types. To the best of our knowledge, this is the study that examined a wide range of lesions in the oral buccal mucosa using different algorithms based on DRS and discerned changes suggestive of early neoplasia with relatively high accuracy. Our study findings are supported by a similar DRS analysis for distinguishing between different tissue types. For example, Koenig et al22 used DRS to detect bladder carcinoma and distinguished between malignant and dysplastic lesions from normal or benign lesions with 91% and 60% sensitivity and specificity, respectively. Similar findings are reported for detection of neoplastic changes in tissues of colon and cervix.14 23 Mallia et al10 demonstrated that information provided by non-invasive DR spectroscopy has excellent potential to diagnose oral cancer in its early stages. Information regarding tissue transformation obtained in vivo with the help of the oxygenated haemoglobin spectral ratio (R545/R575) algorithm was able to distinguish hyperplastic tissues from precancerous dysplastic buccal lesions with a sensitivity of 100% and specificity of 86% and hyperplastic buccal tissues from normal with a sensitivity of 97% and specificity of 86%. Further, in a recent application of the DR ratio to detect cancer on the dorsal side of the tongue, which was not possible with autofluorescence spectroscopy, Mallia et al11 obtained a sensitivity of 86% and a specificity of 80% to distinguish benign hyperplasia from normal, and a sensitivity of 90% and a specificity of 86% for distinguishing hyperplasia from premalignant dysplastic lesions. Schwarz et al17 evaluated the autofluorescence and diffuse reflectance spectra to distinguish dysplasia and carcinoma from non-neoplastic oral mucosa using a depth-sensitive optical spectroscopy system. A total of 424 oral sites in 124 subjects were measured and analysed, including 154 sites in 60 patients with oral lesions and 270 sites in 64 normal volunteers. Algorithms based on spectra from 310 non-keratinized anatomical sites (buccal, tongue, floor of mouth and lip) yielded an ROC-AUC of 0.96 in the training set and 0.93 in the validation set. In comparison we have achieved an ROC-AUC of 0.983, 0.954 and 0.987 respectively, for distinguishing dysplasia from SCC, hyperplasia from dysplasia and hyperplasia from normal tissues of the buccal cavity. The relatively strict selection criteria of the protocol and the application of the leave-one-out method of cross-validation during LDA of the extracted significant PCs would have helped to achieve the relatively higher diagnostic accuracies in this study. Currently, screening is advocated only for cancers of the cervix and breast, as they are the most common cancers in India. However, a WHO estimate suggests 63 441 incident cases of cancer of oral cavity in India in the year 2004. Furthermore, it is estimated that by 2015, this will increase to 78 419 cases.1–3 The vast majority of these cases go undiagnosed, and a conservative estimate suggests a prevalence of at least four premalignant cases per oral cancer case in this population. A high-risk screening approach for malignant changes among individuals over 35 years of age, with any lesions or patches in the oral cavity, using DRS will help in the early detection of both premalignant and malignant conditions. While the high sensitivity of the non-invasive DRS method would guarantee a smaller number of genuine cases for invasive tissue biopsy and time-consuming histo-pathology analysis, the relatively good specificity ensures a lower rate of missed diagnosis. Furthermore, there is hardly any recurring cost for this screening technique. Since, the screening method is non-invasive, cost-effective and easy to carry out by non-specialist staff, the technique can be employed in different clinical settings with minimum additional resources. The near real-time data aid in quick decision-making with no waiting period for the patient. These characteristics of the DRS technique make it a suitable mass screening tool for early detection of oral malignant changes. However, the usefulness of this technique for mass-population screening needs to be examined in an independent study involving a large number of patients from different sites. The DRS data analyses presented in this paper clearly establish the potential use of this technique for early detection of malignant changes in the oral cavity. The relatively high accuracy obtained in this study with very low misclassification rate recommends it as an ideal tool for screening of oral cancer in clinical settings. Furthermore, the following characteristics of DRS, (a) the non-invasive nature of the screening technique, (b) real-time data for quick decision-making, (c) no requirement for massive additional resources and specialised staff for screening and (d) absence of any recurring expenditure for the screening procedure, satisfy all the necessary requirements of a standard screening tool. The public-health implications of this technique are significant, as it is easy to carry out in a variety of clinical settings and even easier to apply in the general public for population-wide screening of early neoplastic changes in the oral cavity. World Health Organization. The World Health Report 2004: Changing History. Geneva: WHO, 2004.
. Oral cancer prevention and control—the approach of the World Health Organization. Oral Oncol 2009;45:454–60.
. Cancer: current scenario, intervention strategies and projections for 2015. NCHM Background papers- Burden of Disease in India, 2005:219–25. http://www.whoindia.org/linkfiles/cancer_resource_commision_on_macroeconomic_and_health_bg_p2_cancers_current_scenario.pdf.
. Oral squamous cell carcinoma overview. Oral Oncol 2009;45:301–8.
. Natural history of potentially malignant oral lesions and conditions: an overview of the literature. J Oral Pathol Med 2008;37:1–10.
. Spectroscopic detection and evaluation of morphologic and biochemical change in early human oral carcinoma. Cancer 2003;97:1681–92.
. Oral cancer detection using diffuse reflectance spectral ratio R540/R575 of oxygenated hemoglobin bands. J Biomed Opt 2006;11:014018.
. Autofluorescence and diffuse reflectance spectroscopy of oral epithelial tissue using a depth-sensitive fiber-optic probe. Appl Opt 2008;47:825–34.
. Comparison of a physical model and principal component analysis for the diagnosis of epithelial neoplasia in vivo using diffuse reflectance spectroscopy. Opt Express 2007;15:7863–75.
. Oxygenated hemoglobin diffuse reflectance ratio for in vivo detection of oral pre-cancer. J Biomed Opt 2008;13:041306, (1–10).
. Diffuse reflection spectroscopy: an alternative to autofluorescence spectroscopy in tongue cancer detection. Appl Spectrosc 2010;64:409–18.
. Reflectance spectroscopy for in vivo characterization of ovarian tissue. Lasers Surg Med 2001;28:56–66.
. Quantitative optical spectroscopy for tissue diagnosis. Annu Rev Phys Chem 1996;47:555–606.
. Reflectance spectroscopy for in vivo detection of cervical precancer. J Biomed Opt 2002;7:587–94.
. Prospective evaluation of a portable depth-sensitive optical spectroscopy device to identify oral neoplasia. Biomed Opt Express 2011;2:89–99.
. Discriminant analysis of autofluorescence spectra for classification of oral lesions in vivo. Lasers Surg Med 2009;41:345–52.
. Noninvasive evaluation of oral lesions using depth-sensitive optical spectroscopy. Cancer 2009;115:1669–79.
. Autofluorecence and diffuse reflectance spectroscopy for oral oncology. Lasers Surg Med 2005;36:356–64.
. Trimodal spectroscopy for the detecton and charcterisation of cervical precancers in vivo. Am J Obstet Gynecol 2002;186:374–82.
. Spectroscopic diagnosis and imaging of invisible pre-cancer. Faraday Discuss 2004;126:265–79; discussion 303–11.
. Non-invasive measurement of the morphology and physiology of oral mucosa by use of optical spectroscopy. Oral Oncol 2008;44:65–71.
. Spectroscopic measurement of diffuse reflectance for enhanced detection of bladder carcinoma. Urology 1998;51:342–5.
. Identification of colonic dysplasia and neoplasia by diffuse reflectance spectroscopy and pattern recognition technique. Appl Spectrosc 1998;52:833–9. Funding This work was supported by carried out with grants from the Department of Science & Technology, Government of India (SP/S2/L-19/1999) and the Centre for Earth Science Studies Plan-223 project. JJL acknowledges Council of Scientific and Industrial Research (CSIR), New Delhi for her senior research fellowship. PJ is supported by the Wellcome Trust Capacity Strengthening Strategic Award to the Public Health Foundation of India and a consortium of UK universities. Ethics approval Ethics approval was provided by the scientific and ethics committee of Government Dental College, Trivandrum, Kerala, India. Contributors JLJ and NS developed the DRS system. JLJ, NS, SM, EKP, PJ and VTB developed the protocol of the study. JLJ, NGU, SM and EKP conducted the study and obtained the data. VTB monitored data collection for the whole study and revised the paper. NGU, KVB, PJ, JLJ and NS wrote the statistical analysis plan, cleaned and analysed the data, and drafted and revised the paper. SM and EKP performed the biopsy, prepared the slides for histopathology and revised the paper. Data sharing statement Only aggregate data are presented in the paper. The complete data set is available from the corresponding author.